Auscript was proud to show its support of the Women’s Legal Service at the annual Dancing CEOs gala on May 5 where the Service hit a new fundraising record of $260,000. As the exclusive provider of recording and transcription services to the Federal Circuit Court, Family Court of Australia and the Queensland Courts, Auscript has proudly supported the Women’s Legal Service since 2015. 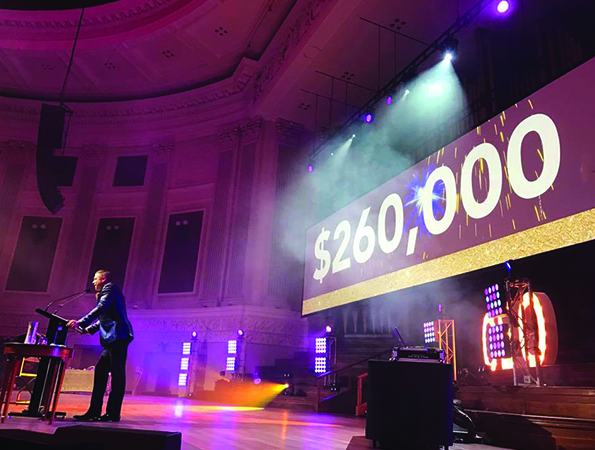 Auscript joined more than 900 attendees at Brisbane City Hall for this year’s Dancing CEOs black-tie event. Auscript Chief Operating Officer Kate Gaske said the Company was honoured to continue its support of the Women’s Legal Service which assists women and children experiencing domestic violence. “This is the third year Auscript has attended the Dancing CEOs gala, and we’re pleased to see it grow every year as the community increasingly recognises the importance of the service for women in need,” Ms Gaske said. The money raised at Dancing CEOs will go towards the ongoing running costs of the Women’s Legal Service Helpline which provides free legal advice in relation to family law and domestic violence matters.